Plaid is this season's alternative to florals, as worn by Cheryl Tweedy. The frills on this dress give it a softer edge. 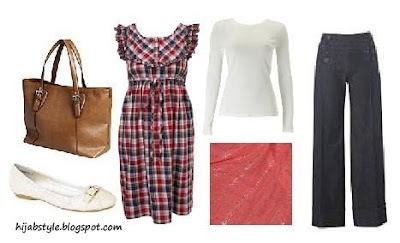 You can find more checked dresses at New Look, £18; Debenhams, £22 and Oasis, £25. Tan bag £15, H&M; brogue buckle flats £15, New Look; Broderie dress £15, Miss Selfridge; white long sleeve top £7, Dorothy Perkins; red hijab £6.99, Muslim Base; denim wide leg trousers £25, New Look. I am going to do a plaid post too, insha'Allah, it is one of the runway looks I like from the Fall RTW 2008 Collection. Though maybe nasty annoymous will accuse me of copying again? I don't know....Should I do it Hayah LOL? Hi Hayah, I like your blog, you're helping me so much as I really struggle to find some decent clothes in London :) thanks a lot! I'm from Tunisia and live in London and I would like to meet and get in touch with some sisters here. Najla, thanks for your sweet comments! There are 'bezaf' sisters in London, the Central Mosque in Regents Park would be a good place to meet people, especially on a Friday. If you need any other help, just ask! Aww, thank you anon! Hope you keep visiting regularly! I made my plaid post, but your dress is so sweet---here in Canada RW&Co makes sweet little dresses like these in the summer. I used to spend my entire paycheck there. Scottish pixie, plaid princess, or picnic, Alix and Hayah we love it!